My fascination with Jollibees has long since past, as I can't deal with their atrocious food. And I am now a huge fan of Famima!! with its red bean buns, multi-meat bento boxes and various office supplies. 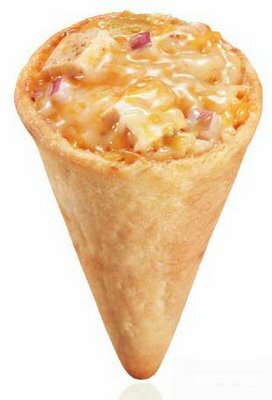 But today I saw something quite jaw-dropping - a restaurant that serves all of its food in ice cream cones. It turns out the Crispycones I was at is the only one in the world! 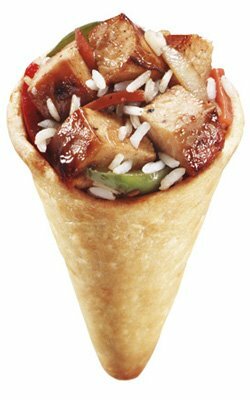 Not even the Japanese or the Filipnos have an edge on us in the cone-food industry. Alas, I had traveled all the way to this particular food court to eat chili, not Crispycones, so I have no idea what they taste like. And frankly, if Jollibee is any indication, I'm better off just imaging what it tastes like rather than actually trying it. Red Rock Chili focuses very simply on a bowl of chili. It is a craving, a passion, an obsession for a simmered combination of meat and chili peppers whose distinctive aroma makes an indelible imprint on the senses. I was obsessed enough to get the three-chili sampler. Then I thought about how bad architecture is and that buildings like these should be destroyed. Also, the chilli website is awful, nothing at all like the Crispycones website. we were there and it is so cool. the smores cone is amazing. forget Chili have a desert.